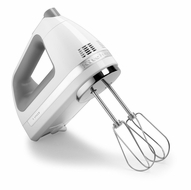 The KitchenAid 7-Speed Digital Hand Mixer has everything you need for effortless mixing and includes two stainless steel Turbo Beater, an 8½ inch (212 cm) long liquid blender and an attractive accessory bag. The powerful DC motor provides years of quiet, reliable operation. Automatic power sensing maintains accurate speed even with the heaviest mixtures.